The founder of Buddhism, Siddhārtha Gautama, who would later be known simply as the Buddha, was by birth what we would now call a Hindu. Although Buddhism breaks with the Hindu tradition in significant ways, it was at the start very much a reform movement from within Hinduism. It is thus essential to understand something of the religious worldview of India in the 6th century B.C.E. in order to understand the Buddha’s own religious worldview and why Buddhism took the particular shape that it did. The dominant religion in northern India up until this point was Brahmanism, based on a body of texts called the Vedas, which had developed orally beginning about 1500 B.C.E. This religious system was also beginning to be challenged from a number of fronts. The Vedic religious world was one of numerous deities, or devas, many of whom were personified forces of nature. offerings such as grain, milk, and animals were placed in a sacrificial fire by a priest, or Brahman, and “consumed” by the gods. In return, according to the Vedas, humans would receive boons from the gods: abundant crops, healthy sons, protection, and so on. This was, furthermore, a hierarchical religious world, formally defined by the division of society into 4 classes, or Varṇas, membership in which was determined solely by birth. It was their role and duty to perform the religious rituals and to preserve and recite the Vedas—to memorize the thousands of verses, to chant them at the sacrificial rituals, and to orally pass these texts on to successive generations of Brahmans. In so doing, the Brahmans maintained the order, or Dharma (Pali, dhamma), of the world, assuring that the gods would be appeased. Just as it was the duty of the Brahmans to maintain the order of the divine world, so was it the dharma of the Kṣatriyas to preserve order in the human realm. It was their dharma, accordingly, to provide food and material goods. Below them were the Śūdras, the labourers and servants, whose dharma it was to ensure the cleanliness of the other 3 classes of humans. Outside this system was a group called untouchables, or outcasts, who had no defined role in the social system and who were viewed as disorderly, as adharmic in character and nature. This was a system of mutual dependence but also of restriction. There was no upward mobility in this system. the Śūdras are the feet (the lowest but in many ways the most fundamental). Thus, social and cosmic order (dharma) can be maintained only if each part of the body is present and “healthy.” Certainly the feet are lower than the head, but without the feet the body cannot stand. A new genre of religious discourse, a body of texts known as the Upanishads, began to emerge out of the Vedic ritual religious world sometime between the 7-5th century B.C.E. the idea of rebirth (Samsāra), the law of cause and effect (karma), the concept of liberation (moksha) from Samsāra, and the practice of asceticism and meditation (yoga). As the ideas of the Upanishads began to spread, some individuals took them to heart and set out to experience the Liberation that they described. These individuals renounced their ties to the material world and set out as wanderers, spreading these new ideas even farther and debating philosophical and meditational points. These various wanderers were called śramaṇas, and the earliest Buddhists saw themselves as a subset of this group of itinerant religious seekers. Also among these individuals was Mahāvīra, the founder of another new religious tradition, Jainism. At about the same time, important social changes were in process along the Gangetic Plain in northern India. Kingdoms began to emerge out of the smaller kinship structures, and with these kingdoms came cities and highly structured systems of government. for although they had economic status, they, as members of the Vaiśya caste, did not have religious status; the Buddha would offer a new religious path that allowed them to develop that status. Buddhist tradition holds that the man who would become the Buddha was born in a small village near what is now the border between Nepal and India in the middle of the 6h century B.C.E. He was born into a Kṣatriya family, part of the Śākya clan, and was given the name Siddhārtha (he whose goal will be accomplished) Gautama. His father, upon learning of his wife’s unusual impregnation, had the dream interpreted by a group of Brahman priests, who stated that the boy was destined to greatness, either as a great king (Chakravartin) or a religious leader. Siddhārtha emerged from the womb—some versions have him diving out of his mother’s side—and immediately took 7 steps in each of the 4 directions, proclaiming that he was the foremost creature in each of them. Because of the prediction of the priests, Siddhārtha’s father kept him confined to the palace grounds, making sure that the young boy could see and experience only sweetness and light. “Bhikkhus [monks], I was delicately nurtured, exceedingly delicately nurtured, delicately nurtured beyond measure. In my father’s residence lotus-ponds were made: one of blue lotuses, one of red and another of white lotuses, just for my sake. . . . My turban was made of Kashi cloth [silk from modern Varanasi], as was my jacket, my tunic, and my cloak. . . . I had 3 palaces: one for winter, one for summer and one for the rainy season. . . . In the rainy season palace, during the 4 months of the rains, I was entertained only by female musicians, and I did not come down from the palace” (from the Aṅguttara Nikāya). Within the confines of the palace, Siddhārtha lived, essentially, a normal Brāhmanic life, passing from the student stage to the beginnings of the householder stage, but all the while being groomed to eventually become king. He married a queen Maya and had a child, a son named Rāhula. “Good charioteer, who is this man with white hair, supporting himself on the staff in his hand, with his eyes veiled by the brows, and limbs relaxed and bent? On two subsequent trips outside the palace grounds, Siddhārtha saw a diseased man and then a dead man, and on each occasion he had much the same discussion with the driver. Siddhārtha wondered if perhaps this luxurious palace life was not reality but instead was an illusion of some sort, and he thenceforth wandered around in a profound existential crisis. and having encountered not only the duhkha that characterizes the world but also, in the ascetic, a potential way out of this realm of suffering, Siddhārtha resolved to leave the palace and go out into the world and wander in search of the truth. He sneaked out in the middle of the night after first going to his sleeping father to explain that he was not leaving out of lack of respect nor out of selfishness but because he had a profound desire to liberate the world from old age and death, from the fear of suffering that comes with old age and death. In short, Siddhārtha wanted to rid the world of suffering. He went off and quickly mastered meditation with a variety of teachers, but he was frustrated and thought that there must be something more than what he experienced as only temporary meditational trances. He thus set out on his own and was soon joined by 5 other śramaṇas. Together they began a course of rigorous asceticism. getting to the point that he could sit in meditation for days, barely eating. The narratives of his life story say that at this point he could exist on a daily diet consisting of one sesame seed, one grain of rice, or one jujube. when I wanted to obey the calls of nature, I fell down on my face then and there; when I stroked my limbs with my hand, hairs rotted at the roots fell away from my body” (from the Majjhima Nikāya). While meditating one day Siddhārtha remembered a passing moment in his childhood when he had slipped into a state of utter calm and equilibrium as he watched a plough turn the earth. He realized with this simple vision that he must somehow return to that humble moment and forge a middle path between the extreme asceticism he had been practicing (and which only leads to more suffering) and the sensual indulgence of his former life in the palace. His fellow śramaṇas abandoned him, cursing and denouncing him as weak willed. At this point a passing woman named Sujāta saw the emaciated renouncer that he had become and offered him a simple gift, a bowl of rice gruel. 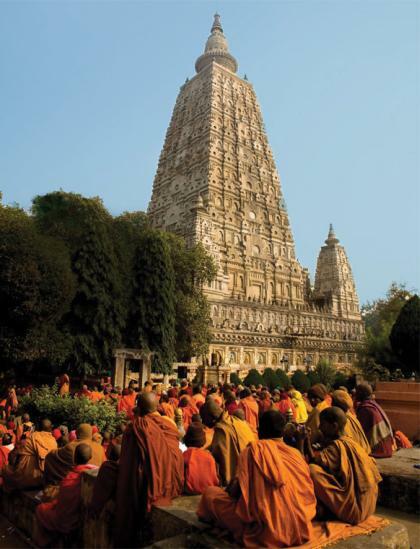 With this modest nourishment Siddhārtha sat down beneath a fig tree near the town of Gaya (known as Bodh Gaya after the Buddha attained enlightenment here) and made rapid progress. In the middle of his meditations he was challenged by an evil superhuman being named Mara, the embodiment of temptations of all kinds, as well as of fear, delusion, and death. In defeating Mara, Siddhārtha metaphorically overcame all such hindrances and quickly attained enlightenment, or bodhi (awakening). After his awakening, at the age of 35, the Buddha spent several weeks meditating on the various aspects of the truth, which he called Dharma, that he had realized. He was initially hesitant to share his teachings, however, for he felt that the simplicity of his meditational vision would be too difficult for humans to grasp and would lead to further confusion and suffering. At this point, according to the tradition, the gods went to the Buddha to convince him to accept his vocation of teacher, appealing to his compassion and assuring him that in fact there were people capable of understanding the dharma. In a similar way, in this world there are people of different levels of development. Thus challenged, the Buddha determined to proclaim the insight he had gained and set out for nearby Sarnath, where he would offer his 1st discourse on the dharma. They gathered around him as he spoke of what is known as the first turning of the Wheel of the Dharma. He laid out the basic outline of his knowledge and experience of enlightenment to these 5 śramaṇas. This 1st discourse represents, in many ways, the beginning of Buddhism, since it is with the sharing of his personal religious experience that the Buddha created the organized religion that is Buddhism. The content of that 1st sermon was so powerful, the tradition maintains, that the Buddha’s first 5 disciples quickly—after one week—attained enlightenment, becoming Arhats (worthy ones). These first 5 followers, in turn, went forth and began to teach the dharma that the Buddha had shared with them; this is the beginning of the Buddhist Sangha, the community and institution of monks that is at the heart of the religion. For the next 40 years the Buddha travelled almost without stop throughout India, sharing the Dharma and gathering followers. This period, known later as the rain season retreat, became an essential element in the formation not only of Buddhist monasticism but also of a Buddhist lay community. Monks settled in small communities throughout India, debating amongst themselves, establishing a formal religious canon and an accepted body of religious practices, and sharing the Buddha’s teachings with the laypeople. by providing them with shelter, food, robes, and alms bowls. Rather, the authority was to be shared by all. it also, after the Buddha’s death, opened the way both for productive debate about the meaning and significance of the teachings that the Buddha had left behind and for disagreement and schism. 3. the Abhidharma (Pali, Abhidhamma; Advanced Doctrine). As these collections were being formed, debates arose among the different groups of monks about the content of these discourses as well as their significance. Furthermore, new situations that had not been explicitly addressed by the Buddha arose, leading to the need for new rules and resulting in further disagreements. These debates often led to schisms within the Buddhist community. The tradition records that shortly after the Buddha’s death a council was held in the town of Rajagriha (present-day Rajgir, in Bihar) to discuss issues of doctrine and practice; another council was held about a century later. - the Mahasanghika (Great Assembly), whose differences initially mostly revolved around issues of monastic discipline, or Vinaya. These 2 groups would evolve into the Theravada and Mahayana, respectively, developing different doctrinal and ritual standards and becoming established in different parts of Asia. One of the most important figures in the history of Buddhism was Ashoka, the ruler (230–207 B.C.E.) of a large empire in India who not only became a Buddhist himself but established a model of dharmic kinship that would remain the standard template for all Buddhist rulers to follow. Ashoka erected numerous large stone pillars throughout India with edicts inscribed on them. These edicts laid out many of the basic aspects of the Buddha’s teachings as well as guidelines for how to live a good Buddhist life. Furthermore, Ashoka established the standard of royal support for the monks by building monastic shelters, planting shade trees and digging wells to aid travellers, and spreading the physical remains of the Buddha throughout India. Enshrined in Chaityas and Stupas—burial mounds of varying size—they became objects of devotion and important gathering places, often associated with significant events in the Buddha’s life, allowing the monks to spread the dharma to larger and larger groups. Ashoka also sent out a number of missionaries, including his own son, Mahinda, to introduce Buddhism and establish monastic orders in other parts of the world, such as Śrī Lanka, Southwest and Southeast Asia, and even Greece. Ashoka had set an important precedent in his support for Buddhism; the support of rulers was an essential element in the expansion and vitality of the religion. For their part, kings were attracted to Buddhism because of its emphasis on individual morality, the lack of caste hierarchy, and the symbiosis between the Sangha and the State. The monks needed the king to provide land, food, and protection, while the king found in the sangha a moral legitimization of his righteous rule. The ideal king was a Dharmarāja (king of dharma)—just, generous, and moral, upholding and promoting the teachings of the Buddha. This basic model is one that continues to be replicated in Buddhist countries today. As Buddhism spread, the Theravada school (sometimes called Southern Buddhism) became particularly well established in Southern Asia, in Śrī Lanka, Thailand, Myanmar (Burma), Laos, and Cambodia. The Mahayana school (sometimes called Northern Buddhism) spread north, first to China and then to the rest of East Asia. In Tibet, for instance, the form of Mahayana that became established was Tantra (or Vajrayana), an extrapolation from the core Mahayana beliefs that puts particular emphasis on the transformative effects of ritual. In China and then later Japan, the Ch’an (Zen in Japan) school developed a form of the Mahayana that places particular emphasis on the meditation experience. Thus, although Buddhism essentially died out in India by the 13th century, its fundamentally missionary character, and its ability to adapt and adopt, enabled it to flourish elsewhere in Asia. focused on the translation of Buddhist texts from their original languages, as well as their philosophical analysis, an offshoot of which was the gradual availability of accessible books on Buddhist belief and practice. Although there have never been huge numbers of Buddhists in the West—estimates vary, but probably no more than 5 million of the world’s 500 million Buddhists live in the West—they have been an important religious presence. In the 19-20th centuries the West also saw an influx of Asian immigrants who brought with them Buddhism, establishing small temples and communities throughout Europe and North America.